Experts say the project at Herring Cove Beach on Cape Cod is a rare example of “managed retreat,” which involves moving away from the coastline. PROVINCETOWN, Mass. — It is a simple pleasure in a classic summertime locale: Pull a car between the stripes on the parking lot, a ribbon of asphalt parallel to the water atop a sloped wall in the sand, and look out over the beach, where one can see Cape Cod Bay meeting the Atlantic Ocean. Amid the unearthly dunes, Herring Cove Beach and its north parking lot draw locals from just down the road and travelers from hundreds of miles away who might arrive in camper vans studded with U.S. flags. Some come for a quick swim, others to watch the sublime sunsets, famous in New England because the beach faces west, not east. 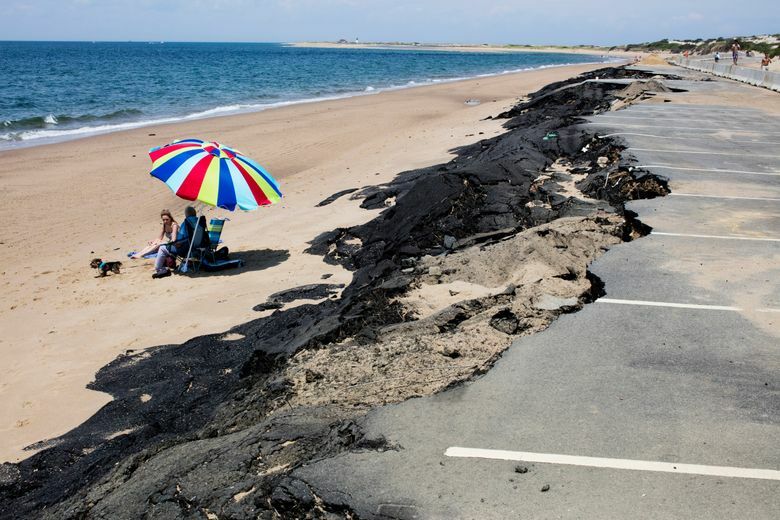 But there is a problem, evident in the chunks of asphalt lying on the sand and the deep fissures in the lot, parts of which are so damaged that they are off-limits to parking: The beach is eroding, and parts of the beloved spot, built in front of the dunes, not behind them, are slowly crumbling into the ocean. 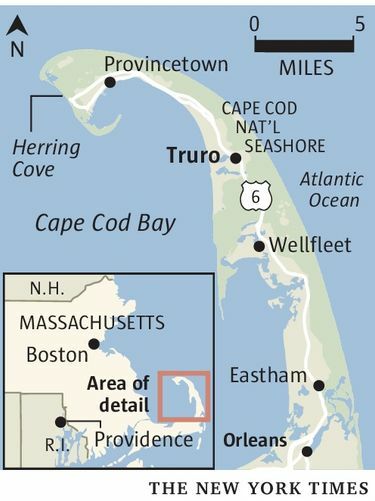 The result here at the Cape Cod National Seashore raises a practical dilemma in a setting meant to be a place to escape: how to react to rising seas and eroding coastlines as climate change looms for coastal communities across the nation. The decision here was to demolish the parking lot and build a new one 125 feet behind it, allowing for a restored shoreline in front of it. “We’re retreating,” said George Price Jr., superintendent of the Cape Cod National Seashore, which is run by the National Park Service. Other facilities at the beach have already been rebuilt farther back from the water. In many parts of the country, like New York, New Jersey and New Orleans, property-damaging storms, tidal surges and floods have been met with the urge to shore up and rebuild. Experts say the project at Herring Cove is a fairly rare example of the opposite approach, called “managed retreat,” which involves moving away from the coastline. Price and many who use the beach do not want to fight coastal change; they want to adapt to it. “It reflects a sound planning approach that is regrettably uncommon so far,” said Michael Gerrard, a professor at Columbia Law School and director of the Sabin Center for Climate Change Law there. Managed retreat comes in many forms, in addition to the physical movement of infrastructure: buyback programs, in which a government purchases vulnerable properties from private owners, or bans on new construction or hard armoring of the coast in areas susceptible to flooding or storm damage. But it is a wrenching decision, especially when private property is involved, and is politically difficult to carry out, or even to suggest. That makes the project at Herring Cove, and others on Cape Cod and around the country, all the more unusual. Some New England towns have used state grant money to support resilience plans, such as the relocation of a parking lot and retaining wall on Squibnocket Beach, in Chilmark, on Martha’s Vineyard. And, one day last week, a new parking lot, farther away from the water, was drying at Breakwater Beach, in Brewster, farther south on the Cape, part of a retreat project that had drawn passionate objections from neighbors who did not want to see it take away from an open park near the water. “Change is very difficult, especially when it’s your favorite place in the world,” said Chris Miller, director of the town’s department of natural resources. At the moment, the Herring Cove parking lot is in a kind of limbo. The Park Service is in the midst of a $300,000 repair that will allow the lot to operate at about half capacity until officials get $3 million to move the lot back, which they hope to do in 2018. For Don Robitaille, 84, a retired soda-machine repairman who had driven his camper to the beach from Maine for the contentment of sitting on a beach chair with a book of puzzles and an open view of the ocean, it was still a perfect getaway. Some beachgoers worried the eventual relocation of the lot would change the experience of being there. But others in town, like Avellar, are merely frustrated that the big move is not happening sooner, and that tourists have arrived only to find a mess.